You are at:Home»Posts Tagged "Public Health"
Increased consumption of eggs and dietary cholesterol is linked to a significantly higher risk of cardiovascular disease and death, according to a new study. Julie Kelman, a third-year medical student, was the first author of a study that found an association between neighborhood density of convenience stores and the development of coronary artery calcification. Betina Yanez, PhD, received the New Investigator Award 2019 from the American Psychosocial Oncology Society. Americans with primary care received significantly more high-value care and reported better patient experience and healthcare access, compared to those without primary care, according to a study published in JAMA Internal Medicine. Anna Briker, a second-year medical student, discusses her research investigating sleep-related risk factors in unexplained infant deaths in Cook County, which could be used to inform prevention programs. Northwestern Medicine professionals treated nearly 1,000 patients as part of a medical mission trip in late September. A new study aims to answer a resilience puzzle: Why second-hand experiences of neighborhood violence affect some youth, but not others. Feinberg faculty, staff, students and community partners gathered at the inaugural IPHAM Population Health Forum to share their experience improving the health of communities in Chicago and around the world. 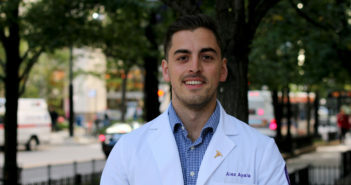 Alex Ayala, a second-year medical student also pursuing a master’s degree in public health, is the president of Chicago Medicine Street Outreach, a student organization that provides care and support to the homeless. Stephen Whitfield, a fourth-year medical student, is involved in several organizations and initiatives to advance health equity in the Chicago area.